In my attempts to return to blogging, I have run into quite a few little hiccups. Moving, settling and starting a new job are all things that have kept me busy. But the biggest delay were some technical difficulties I ran into. My external hard drive crashed, taking with it several recipes & pictures. (I thought the external hard drive WAS backing up. Lesson learned.) Then the laptop crashed taking what remained of some of those pictures & recipes. This really slowed things down. Some of my recipes are lost, possibly forever, but I have managed to recover some of them. I got myself a shiny new external hard drive & a shiny new laptop & one day, I will look into this thing called “the cloud” for better back up. For now, I have three more Korean fusion recipes to share. I will try to splice these in with posts about our America roadtrip. First up, dessert mandu. Mandu, Korean dumplings, are usually filled with minced meat, ginger, green onions, dangmyeon (sweet potato noodles) & garlic. They are served with a dipping sauce made with soy sauce, vinegar & chillis. Wangmandu – a really large steamed dumpling. The term wang means king, so this is king mandu or king dumpling. There are other variations, such as shrimp mandu or mandu with red pepper, etc. However, in my experience, I saw those much less often than the types listed above. Gunmandu (pan fried) was always my favorite. If you’ve ever seen “Old Boy” the main character, Oh Dae Su, is forced to live off a diet of gunmandu for 15 years. He later eats at every gunmandu restaurant he can find to help him indentify his captors. Also, there is the Japanese variation known as yakimandu or gyoza & the Chinese variation known as pot stickers in the West. So you might already be familiar with pan fried mandu or the idea of it. 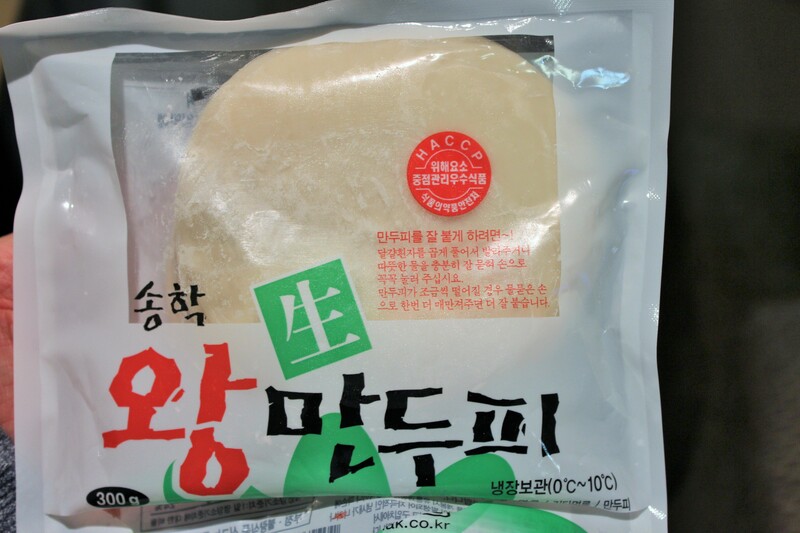 To make mandu you will need dumpling wrappers called mandu pi. You can find these in Asian marts, Korean shops or the foreign food aisles. There are also handy recipes to make your own online. If you wish to make your own, I recommend this video from Maangchi. She is one of my absolute favorite food bloggers, especially for learning more about Korean food. So check her out! Here is what mandu pi look like packaged. These say “Wang Mandu Pi.” Although, I believe they are the standard size dumpling wrapper for mandu. I never saw any smaller in the grocery stores. For this fusion, I wanted to play around with the idea of creating a sweet, dessert style mandu. So I made two…and attempted to make three. My successes are below. If you heard my interview on TBS eFM’s 101.3 Mainstreet, Ahn Jung hyun asked me if I’ve ever had any recipe failures. Ummm…yes. It goes with the territory. In my attempt to make sweet mandu, I have one very good example of a failure. I tried to make pop tart mandu. To make mandu, you need mandu pi. And to make poptarts, you need to bake or toast a pastry. However, Mandu pi is a dough that is similar more similar to ravioli or pierogi dough than pastry dough. Therefore, i doesn’t just bake. It steams, it boils, it fries. It does not bake. My mandu pop tarts were crunchy & not in a good way. It was like trying to bake lasagna without boiling the noodles first. This recipe might be possible through boiling first, then baking. However, it would not have the texture of a pop tart. Lesson learned = do more diligent research before assuming to understand a dough. To make the strawberry dipping sauce, dice one pint of strawberries. Add the strawberries to 1/4 cup sugar in a sauce pan. Bring the berries & sugar to a boil stirring constantly. Reduce to a simmer & let thicken for 10 minutes. Place 1 tsp of peanut butter & 1 tsp of nutella in the center of each mandu pi. Using a pastry brush, brush the outer edges with the beaten egg. Fold the pi in half, making sure the filling stays in the center. Use a fork to seal the edges together. Heat the oil in a frying pan. Place each mandu in the frying oil. Allow them to fry for 2-3 minutes on each side. Drain them on a plate lined with paper towels. Allow the mandu to cool slightly before eating. Serve with strawberry dipping sauce. Finely dice a handful of strawberries. Place some diced berries & 1 teaspoon of nutella in the center of each mandu pi, careful not to overfill the mandu. Using a pastry brush, brush the outer edges of the mandu pi with egg. Fold the pi in half, making sure the filling stays in the center. Use a fork to seal the edges together. Heat the oil in a frying pan. Place each mandu in the frying oil. Allow them to fry for 2-3 minutes on each side. Drain them on a plate lined with paper towels. Allow the mandu to cool slightly before eating. Once the mandu have cooled, dust them with confectioners sugar, if desired.